This article appeared in the December issue of the INSIDER Newsletter: while not being a typical automation and control story it has some relevance to control systems, used to upgrade the performance of a simple sensor. A news item from Arden Photonix attracted my interest. In the UK, the National Physical Laboratory has been using commercially available liquid lens technology, as developed for mobile phone cameras, to simplify the design of the measurement devices used to characterize light beams from lasers, without sacrificing any of the accuracy available with the conventional slow, cumbersome and difficult to adjust devices used at present. The BQM-50 from Arden is ideal for measuring lasers used in surveying, precision measurement, laser radar (LIDAR) and retinal hazard assessment. So what is a liquid lens? A liquid lens is a very small lens device that uses an electronic control system to change focal length (to focus) and change optical axis (for optical image stabilization, ie to reduce camera shake effects) – all within a few milliseconds. The idea for this invention came from research on the phenomenon known as “Electro-wetting” by Professor Bruno Berge, in Lyon, France, with the original patents being issued in 2002. Prof Berge started working on liquid interfaces from 1991 at the Ecole Normale Supérieure in Lyon, in co-operation with the Université Joseph Fourier of Grenoble, where he had two years previously done his PhD. Berge became fascinated by Electro-wetting, a topic first investigated by Gabriel Lippmann around 1900: Lippmann went on to win the Nobel prize for colour photography in 1908. Berge believed that manipulating the shape of a water drop would also change the way it refracted light, which – for all practical purposes – would turn it into a lens. A drop of water affected by electro-wetting can function as a variable magnifying glass: so two clear, non-miscible liquids of the same density, one being electronically controlled water, can serve as a lens, depending on the curvature of the interface between them. If the second liquid is insulating (an oil), and not affected by the field, this curvature changes when a voltage is applied, enabling an image to be captured and focused (using a standard type of electronic feedback control system). The two liquids are sealed and held in a metal casing that is typically smaller than 10mm in diameter. Berge first approached Canon cameras with the invention, but got no interest (However, see later!) So with French state funding, and investment fund backing, Berge founded the company VariOptic in 2002. In 2007 they established a production line in China, and in 2009 the first barcode reader with a VariOptic lens appeared on the market. 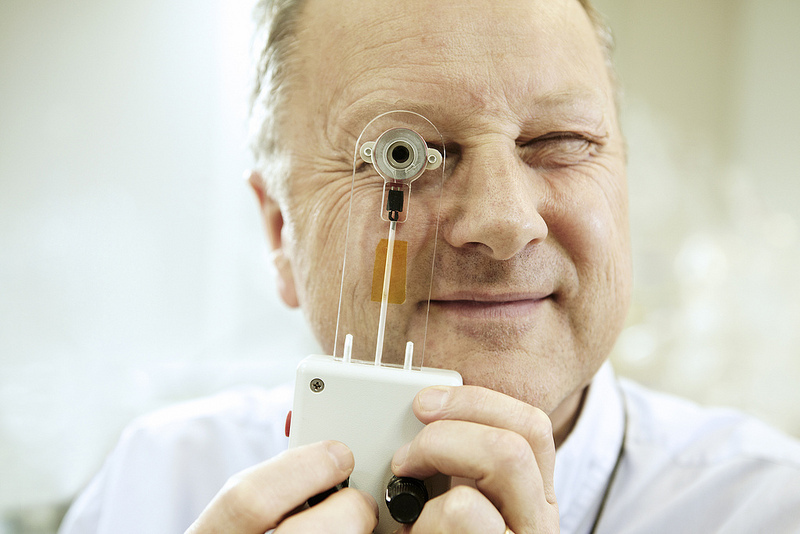 In 2011, VariOptic was acquired by Parrot SA, and will focus on industrial applications: a separate company, Optilux, was formed in the USA to bring the liquid lens technology to smartphones and tablets. In 2013, Berge was selected by the European Patent Office (EPO) as a finalist in their annual review of patented inventions. Machine vision manufacturer Cognex is another early adopter of the technology. Cognex has equipped both handheld and fixed versions of its ID readers with VariOptic liquid lenses. Lattice Semiconductor Corporation has also announced a new video camera development kit, equipped with VariOptic liquid lens technology. * The Canon 2013 published patent on electro-wetting technology for lens construction uses the electrodes in two separated fluids to act as pumps, to transfer different amounts of the fluids to cavities within a separate lens element. Fairly complex, but we will wait to see if the complexity is justified by any advantages, one of which is to circumvent the Berge patent that they turned down over ten years ago. * The last recent technology step in lens construction was made by Peter Dollond in around 1760, for which he was granted one of the first UK patents: his recorded idea was to produce an achromatic lens by using a doublet (twin lenses nestled together) made of crown and flint glass, to be used as the objective (big) end of a telescope. Things were simpler in those days. His sister, Sarah, married Jesse Ramsden, and these two men were the best telescope makers in the world, working in the Strand, the Haymarket and then Piccadilly in London between 1760-1800. One apprentice, who then went on to work for Jesse Ramsden, was called Matthew Berge, and he took over from Ramsden in around 1800 and worked in the Piccadilly premises from 1802-1817. 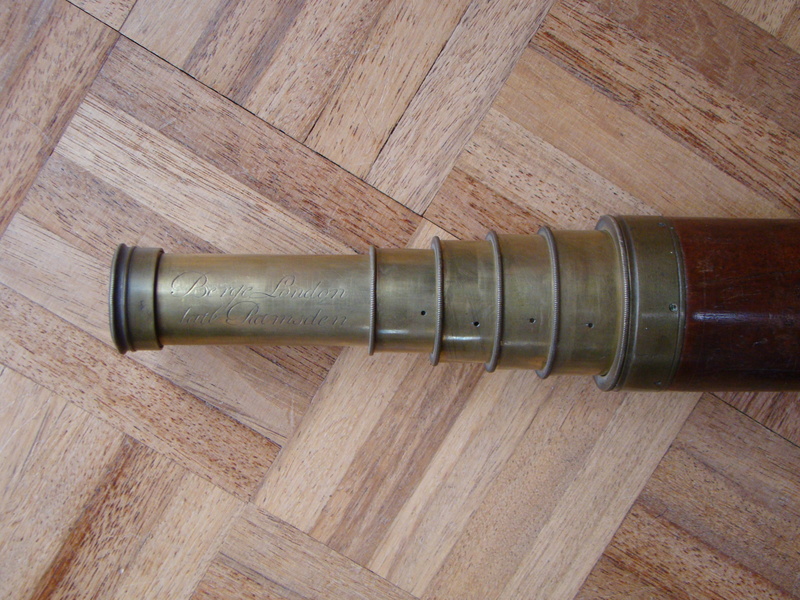 Many years ago he gave your editor, via Ebay, a lovely sample of the type of nautical telescope he constructed there. Who knows, maybe Prof Bruno Berge comes from the same lineage? Matthew Berge constructed these telescopes for use by the ship’s officers on the wooden sailing ships used by Nelson’s fleet, fighting at Trafalgar against the French and Spanish: what would he think today about these French-developed lenses housed in an iPad? Back in August, Kentz, the UK/Ireland based engineering and contracting group, fought off a takeover bid from AMEC. The AMEC interest was said to be particularly in the Kentz expertise in LNG processing facilities. Kentz at the time had $180m in cash reserves, and were quoted to be seeking an acquisition (See the INSIDER Newsletter for September page 7). This month Kentz announced the proposed acquisition of the Valerus field solutions business in the USA for $435m. Valerus provides a full suite of products and services for oil and gas surface facilities from the well head to the pipeline. Valerus will offer Kentz exposure to the onshore shale gas market, and increased exposure to Latin American markets, with the Valerus presence in Brazil, Mexico, Colombia and Venezuela. Valerus 2012 revenues were $493m, with EBITDA of $52m: it employs 665 people. The previous post on this weblog mentions that AMEC has been reported as considering a bid for US based Foster Wheeler: combined these two groups would create an energy services group worth $8Bn.